More brilliant work from my second-favorite animation studio, Aardman. Here are a series of spots for Animal Planet promoting green solutions to help solve our environmental crises. Look for all the hallmarks of Aardman animation: Simple, clear staging? Check. Appealing characters? Check. Charming Brittish accents? Check! Thanks for the link. Those were great! I especially liked the cheetah one. Hey Victor! Im a big fan of you and i sent you an email, i love your work, i hope you can read it. 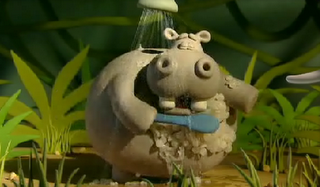 man I love me some Aardman!....just caught the new American Creature Comforts tonight...so inspiring! !